I’ve always loved sound. Working in radio for a couple of years before I got my first job as a cameraman made me familiar with the tools of the analogue sound world. Then doing TV commercials, even though I was rarely involved in the sound post in a hands on capacity, I still loved sitting in on the mix and voice over recording sessions whenever I could. As the industry transitioned from analogue to digital, one thing that remained pretty constant was the microphones. Sennheiser on-air or on-location and Neumann in the production studios. In recent years I have been enjoying bit by bit into doing more and more hands on sound post as the tools have become more powerful and accessible, just as they have with pictures. The level of freedom and creative options by having direct control of the sound design and mixing has been great. 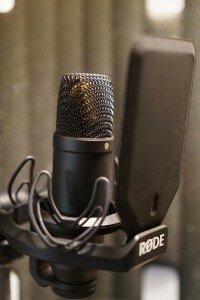 Our first Røde purchase was a Podcaster USB mic for doing rough voice overs which we still use for that purpose today. We quickly realised that the quality was actually pretty good and in 2009 we added an NT1-A and started doing finished voice overs as well. Because of my radio experience I sometimes also do the voice overs myself, so I’m acutely conscious of the character of a microphone. The NT1-A turned out to be a great tool for us. 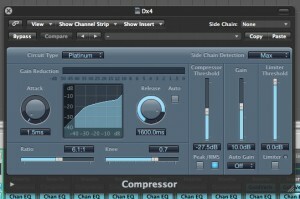 It has a good, clean sound that responds well to lots of EQ and Compression in the mix for a strong voice over sound. Because of its price point, it is something that doesn’t need to be working all the time in order to be worth owning. Working in advertising I generally assume that “new designs” usually only have a few changes and “all-new” means they’ve only changed the colour! So when Røde released the “all-new” NT1 with a black finish, I assumed that it was an incremental update on the NT1-A that I’ve been so happy with. How different could it be? I was recently shooting an interview with Røde founder Peter Freedman for the NSW State Government and in the process learned more about the new mic and began to get a lot more interested. 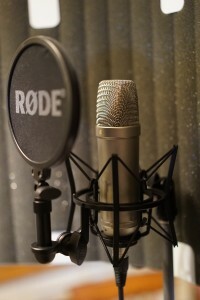 When Røde sent over a demo unit to try, I set it up, put the headphones on and uttered the the obligatory “one, two, testing one, two” into the NT1, and I was vividly transported back to the experience of speaking into a Neumann for the first time, as a high school student visiting the production studio of a radio station. The brightness, clarity and at the same time, loads of warmth that those classic studio microphones are famous for was coming back through the headphones. This is actually a very different beast. Plenty has already been written about the NT1 for music so I’ll keep this focused on voice overs. The microphone itself feels solid and the matte black finish is a nice modern touch and while the overall shape is that of any traditional, side address large diaphragm condenser. The shockmount is also a new twist on the classic design and works very well. I was surprised to discover that the NT1’s rectangular pop shield is made of metal and although I was a bit unsure of how this would work, it is actually very effective. This test was done with the NT1-A and the NT1 and recorded as uncompressed 24 bit PCM using identical settings on an R16 multitrack recorder and clean settings in Logic, until the compression & EQ were added. After doing this test, I would be more than confident in using the NT1 for pretty much any voice over job. After having a closer listen and a play in Logic, I think the NT1-A might still have an edge for ADR, where its very neutral sound makes it so easy to sit the sound into whatever different environments it needs to. In the mix, I think can get a comparable level of brightness and clarity from the NT1-A with a little bit of effort but having so much of that in the starting point and having the extra warmth from the NT1 makes it a significant improvement for voice over work.